A Communist Consumers Museum? Isn’t that a contradiction in terms? I mean, in the Cold War, we in the West were the consumer society. We still are. They were, well, communist. 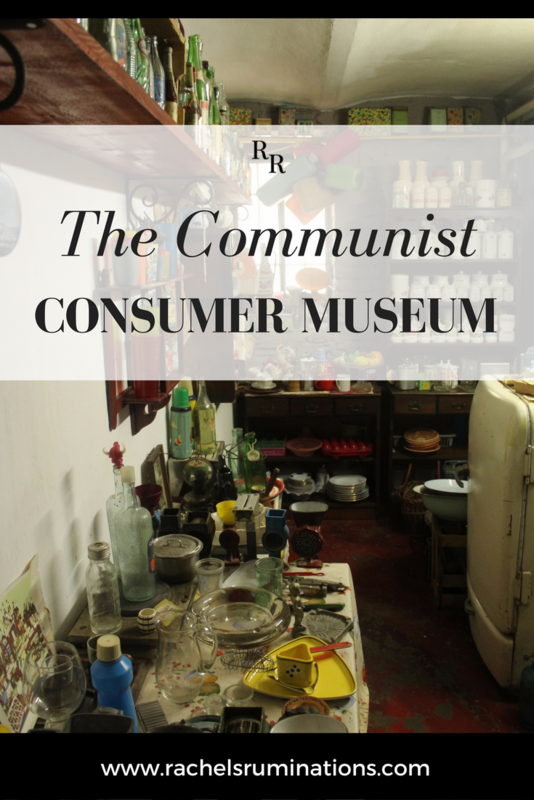 So what could a Communist Consumers Museum even show? When we passed through Timişoara, Romania, this summer, we didn’t really have any plans. Picking up a map at the tourist information office, we wandered around, admiring the faded glory of so many of the buildings. 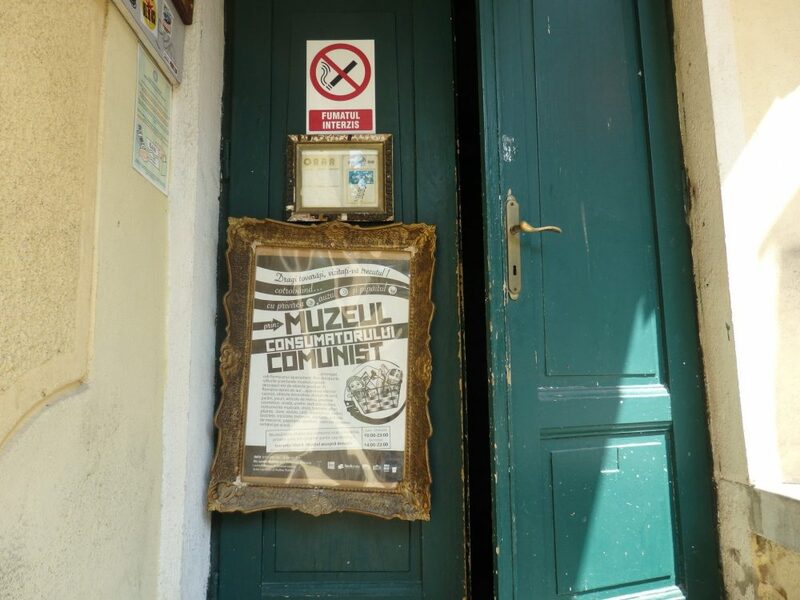 By mid-afternoon, we’d seen most of the churches and plazas that the map highlighted, and decided to visit only one of the city’s museums: the Communist Consumers Museum. We chose it purely based on its name, and the curiosity it aroused. Housed in the basement of a pub called Scârţ Loc Lejer, the museum is easy to miss. Climbing a small flight of stairs, we entered the pub: dark but pleasant-looking. Pictures and posters of varying quality covered every inch of the walls, and brightly-colored open umbrellas hung from the ceiling. 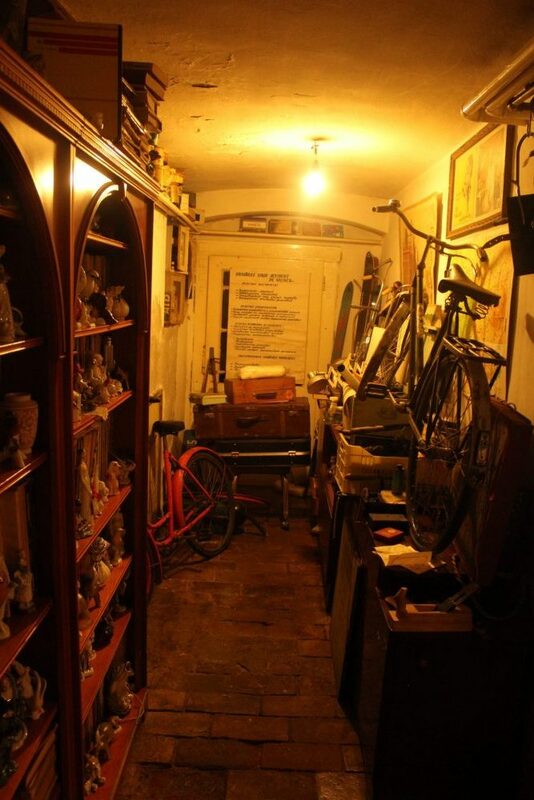 The museum is free, and you access it from the first room of the pub, down a staircase into the basement. Our eyes adjusting to the dim lighting, we realized that the hallway we entered was lined with … stuff. Bicycles and pictures and every possible item just standing or hanging or piled around us. The Communist Consumers Museum isn’t so much a museum as a collection. Nothing is arranged or specially lit, or even labeled, as I’ve come to expect from museums. 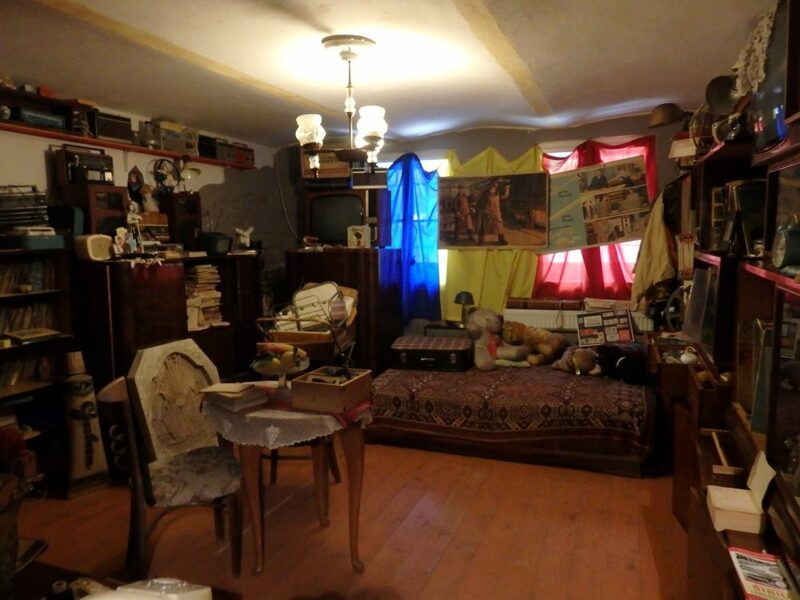 The set-up resembles, rather vaguely, a communist-era apartment in that there is a living room, a bedroom and a kitchen, along with that hallway piled with … artifacts? Junk? Treasures? I suppose it depends on your point of view. At the bend of the hallway stands a bookcase. In front of the books is a collection of ceramic and plastic figurines: “chotchkes,” my mother would have called them. The bedroom, living room and kitchen overflow with things as well: far more than any apartment would have held in the communist era, I’m sure. 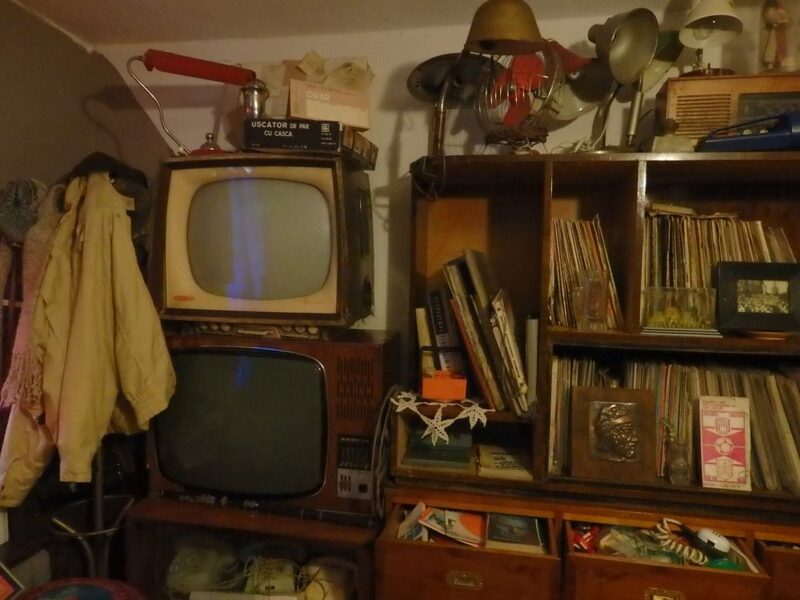 In the living room, I counted five television sets, though there may be more, piled precariously with vintage radios, record players and other unidentifiable appliances. The bedroom is mostly dedicated to children’s items: toys mostly, bicycles, games, and so on. Piled to the ceiling on all sides, it’s a room I’d never let a child loose in! In the kitchen, empty liquor bottles line shelves. So do dishes and containers: ceramic, metal and plastic. The kitchen table supports not one meat grinder, but a row of five, all different, on each end. An open cupboard reveals complete sets of ceramic – or possibly plastic – containers for flour, sugar and so on. To me, it was less personal than that. When I visited the DDR Museum in Berlin, I saw a case showing souvenirs that East Germans brought back from travel to other Eastern European countries. 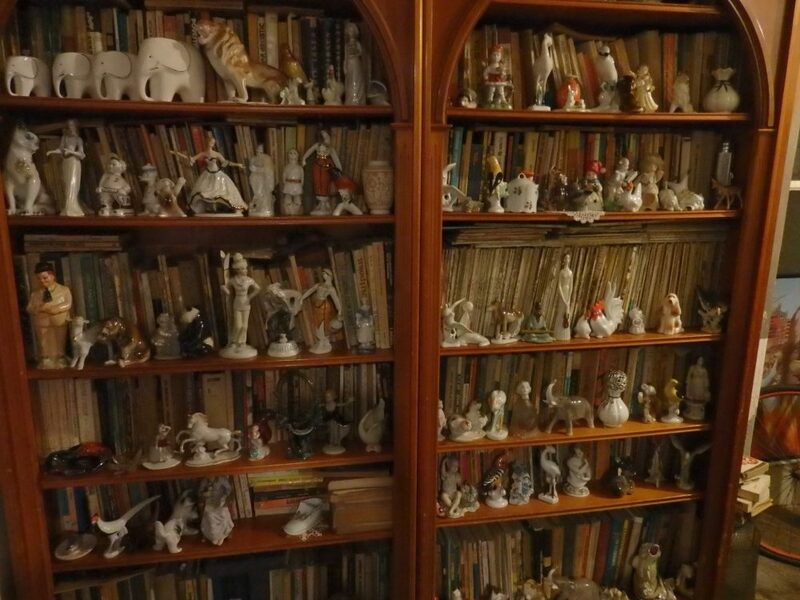 It never occurred to me, to be honest, that people would have bothered with collecting, for example, ceramic figurines. But of course they would. People want a bit of beauty around them … though beauty is a matter of taste! Many of the items did strike me as vaguely familiar: some of the toys particularly. They weren’t the toys I had as a child in the sixties, yet they were similar in style. What we call “vintage” now was fashionable then, and clearly the styles transcended the Iron Curtain. I found myself wondering how this museum came to be. Did some hoarder collect all this stuff and just start calling it a museum? Did people start donating their unwanted, no-longer-fashionable items once the Cold War ended? 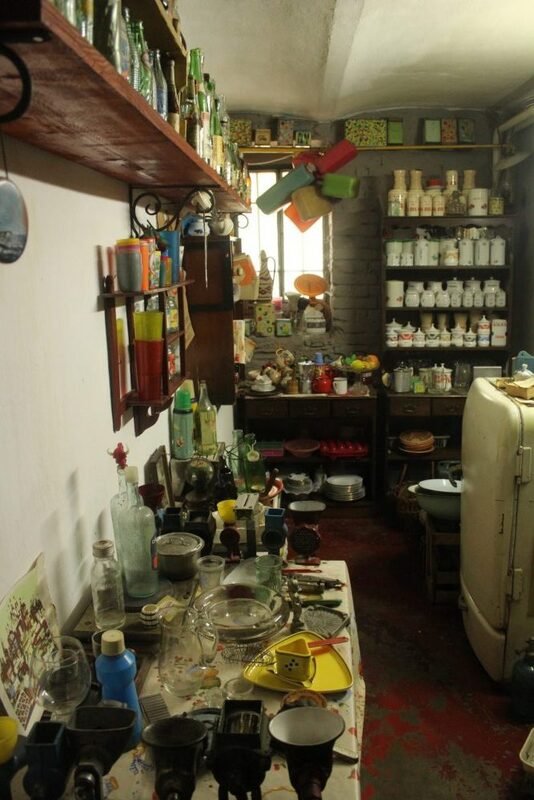 According to Atlas Obscura, the Communist Consumers Museum is still accepting donations. Where could they possibly fit more stuff? I enjoyed the chaos for the most part, but a real museum would curate the collection. They’d set up the rooms to look like they would have in the time period they are presenting, not like some packrat’s nest. The curators would store the rest of the items somewhere else, and perhaps rotate them into the display areas for variety. Someone would be there to explain the items and answer questions as needed. For example, I would have liked some explanation of consumer goods in Eastern Europe. Did the manufacturers of ceramic figures compete with each other, just like in the West? Did they literally copy Western consumer items, or did they independently develop them, influenced by Western aesthetics? I would have happily paid an admission fee for a real museum. The pub, by the way, has a very pleasant garden and serves all the usual pub drinks. After your museum visit, stay for a drink, and make sure to leave a hefty tip to thank them for not charging admission. It’s on Saszlo Szekely Street 1 in Timişoara. As someone who despises clutter, I doubt I would enjoy this ‘museum.’ But thx for telling us about it, Rachel. As I was reading this, I kept wondering how this museum even came to be — just as you were. I would love to see this place just as it is — disorganized and begging questions. It’s definitely a different kind of museum than I’ve come across. I’m finding that I’m drawn to this kind of museum: ones that show just random stuff that people have collected. There’s something fascinating about the odds and ends of everyday life. I love the museums you take me to as I would likely never find them on my own. And I have to admit those museum displays looked remarkably like my summer of slogging clean out efforts. Perhaps instead of selling the house I should have just hung a sign and made it a museum!! Most fun post! Thanks! I think there may be a lot of museums that result just from people’s over-the-top urge to collect things! This post was my impetus for starting a Romania Pinterest board, so there it now resides in all its pinned glory. Did anyone in the pub know anything about the museum, its origins, purpose, plans? Whenever I think about life behind the dum, dum, dum, dum (cue scary Radio Free Europe music) Iron Curtin, I imagine a life devoid of consumer goods beyond very basic commodities and food. I’m pretty sure my social studies text books had photos of people queuing up for their weekly bread ration. Interesting find. Exactly what I pictured! Not people spending money on dust collector chotchkes to sit on shelves! I’ll have more posts on Romania in the next several weeks. This is the first time I am hearing about this museum and it seems worth visiting, Rachel. Is it usually crowded?